Three players make 6 fullcourt trips, no dribbling. 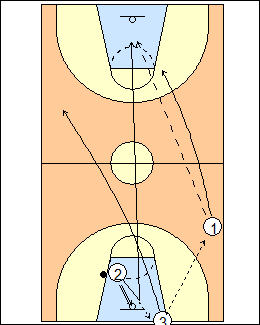 2 scores, taps the ball out of bounds to 3 before the ball hits the floor, sprints upcourt, 3 inbounds to 1 who passes upcourt to 2 who scores (the scoring pass can be a bounce pass). 1 follows his pass, 3 sprints to the outlet spot. The ball can't bounce after 2 scores, 1 taps it to 2 out of bounds, who inbounds to 3, 1 sprints upcourt to take the layup, 2 goes to the next outlet spot, 3 follows his pass, will tap the ball out of bounds to 1, and be the next shooter. Keep going, each player has to make two baskets in about 30 seconds or less (i.e. go up and back three times). The next group goes on the last trip, after the layup 5 will tap the ball to 6 out of bounds. Don't fumble the ball, be accurate with passes, make backboard swishes. 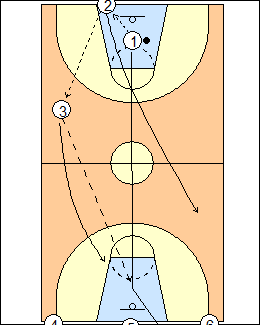 See Passing - 3-man super weave, Fast break - UConn 3 on 0.